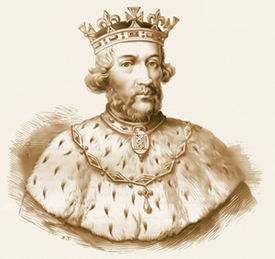 Edward II was born at Caernarvon on 25 April 1284. 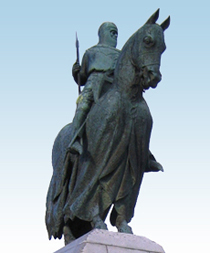 He succeeded to the throne of England upon his father's death on July 7 1307 becoming not only King of England but titular Overlord of Ireland and Scotland and also Duke of Aquitaine. Edward was a typical Plantagenet being tall and good-looking and possessing an alert handsome face. In these qualities he was very much like Edward I but he differed to his father in that he had a shallow nature. Usually he wore a slightly pointed beard and his bright auburn hair had a natural curl to it. Edward's father had apparently expressed the wish on his deathbed that his son would continue with his campaign against the Scots but this errant offspring made only a token foray into Ayrshire before returning as quickly as possible to the glamour and high life in London where he would be surrounded by his personal circle of fawning favourite courtiers. His closest friend in this inner circle was the flamboyant and foppish french boy Piers Gaveston, who was the son of a valiant knight from Gascony. With Piers, Edward was often the instigator of wilful pranks and frivolity. This friendship with Piers Galveston was ultimately to be the king's undoing! King Edward I had obviously realised the danger and when on his last campaign, he had ordered the Gascon's banishment but barely a month after his father's death, Edward brought him back making him Earl of Cornwall - a title usually restricted to the Royal family. Edward then appointed Gaveston Regent of England whilst he went over to France to marry the King's daughter the 16-year-old Isabella (later to be known as the 'She Wolf') to whom he had been betrothed for 10 years. Ultimately, Thomas Lancaster, one of England's most powerful magnates was so infuriated that he formed the council: the Lords Ordainers, which forced Edward to exile Gaveston permanently. However the unrepentant Gaveston once again reappeared at court and after this he was captured by Lancaster and beheaded after having a sword plunged into his heart! At this point, four years into his reign, the only event which brought any ray of sunshine into Edward's life was the birth of his son and heir.